(Nanowerk News) A recently published Journal of Aviation Technology and Engineering article ("Measuring the Effectiveness of Photoresponsive Nanocomposite Coatings on Aircraft Windshields to Mitigate Laser Intensity") shows Lewis University researchers have created a coating for aircraft that reduces pilot distraction from laser attacks. (L to R) Nantotechnology scientist Dr. Jason Keleher and Pilot Dr. Randy DeMik are part of the Lewis University team of experts working on reducing the impact of laser attacks on aircraft. In 2013 study, Lewis University proved these laser attacks, which average around 3,750 incidents a year, can be a distraction to pilots and a potential safety hazard during critical phases of flight. As part of continued research on the matter, Lewis University recently developed a practical and economical solution through the use of photoresponsive nanocomposite coatings on aircraft windscreens. Authors of this study include, Dr. Stanley Harriman, Assistant Professor of Aviation and Transportation, Dr. Ryan Phillips, Assistant Professor Aviation and Transportation, Dr. Randal DeMik, Associate Professor in Aviation and Transportation, Dr. Charles Crowder, Associate Professor of Physics, Dr. Jason Keleher, Associate Professor and Chair of Chemistry. 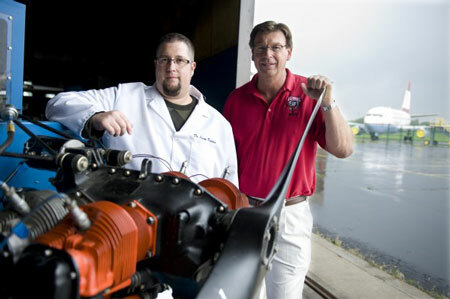 At the time of the study, Aviation graduate students Joseph E. Burlas and Steven F. Emmert contributed to the article. During their undergraduate studies, Chemistry students Hubert K. Bilan, Zachary X. Widel, Samantha J. Brain and James T. O’Malley III and Physics student Matthew Moy contributed as well.